B.M. and Performer's Certificate, The Eastman School of Music at the University of Rochester. Jim Pugh joined the University of Illinois at Urbana-Champaign faculty in 2005. 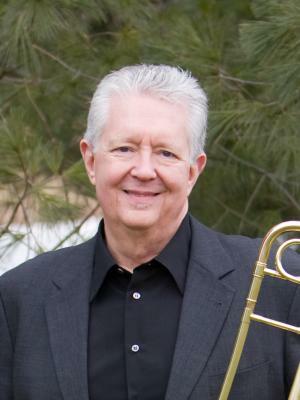 Jim is a distinguished trombonist, composer, and educator. The inspiring virtuosity and incredible versatility he has demonstrated during the course of his career has caused Jim to be often honored as the “musician's musician”. Whether he is performing as a concerto soloist in a symphonic setting, recording and touring with legendary artists in the fields of classical, jazz, and rock, or bringing forth his own exciting new compositions that expand the role of brass in contemporary music, his creativity knows no boundaries. Jim began studying piano at age five and trombone at age ten. After studies with the legendary Emory Remington at the Eastman School of Music, he toured extensively as lead and solo trombone with the Woody Herman Band and with Chick Corea before opting to settle down in New York City. Jim became New York's top-call freelance trombonist for film scores, records, and music for television and radio advertising: over the past thirty-years he has lent his special talent to more than four thousand recording sessions. His trombone can be heard in recorded collaboration with leading classical and popular artists and orchestras such as Yo-Yo Ma, Steely Dan, Eos, Concordia, St. Luke’s Orchestra, André Previn, Paul Simon, Barbara Streisand, Tony Bennett, Michael Jackson, Madonna, Pink Floyd, and Frank Sinatra. Jim has been called on to add his solo trombone to feature film soundtracks including A League of Their Own, When Harry Met Sally, Meet Joe Black, and on hit Broadway cast recordings City of Angels, Fosse and Victor/Victoria. Since 2000 he has been the solo trombonist with the seminal jazz/rock group Steely Dan, both recording and touring. In 2003 Jim "re-premiered" the Nathaniel Shilkret Trombone Concerto to a sold-out audience at Carnegie Hall with Skitch Henderson and the New York Pops Orchestra. This mid-twentieth century masterpiece, originally written for Tommy Dorsey, can be heard in its first recording, along with Jim's own Concerto for Trombone and Orchestra and Jeff Tyzik’s Trombone Concerto, on his CD “X-Over Trombone”, released by Albany Records (TROY926). Jim is the only recipient of the National Academy of Recording Arts and Sciences Virtuoso Award for Tenor Trombone, awarded after being voted Tenor Trombone MVP by the New York recording community for five years. Jim's original music and arrangements can be heard on National Public Radio (Morning Edition, Weekend Edition, Performance Today), in film scores and jingles, on record and since 2009, on the Tony Awards TV Broadcast. His composition, "Lunch with Schrödinger's Cat", received a Lincoln Center premiere in 1989 by Marin Alsop and the Concordia Chamber Orchestra and was most recently performed at the Krannert Center in 2012 by Sinfonia da Camera. Jim premiered his Concerto for Trombone and Orchestra in May 1992 with the Williamsport Symphony. It received its New York premiere in March 2000 with soloist Joseph Alessi and Leonard Slatkin conducting the New York Philharmonic. The piano reduction version has been recorded by Peter Ellefson, Professor of Trombone at Indiana University. A founding member of the Graham Ashton Brass Ensemble, several of Jim’s compositions can be heard on the group’s CDs “The Graham Ashton Brass Ensemble Plays The Music of James Pugh and Daniel Schnyder” and “Scenes of Spirits”, both available on the Signum label. Prior to his appointment at Illinois, he taught at SUNY-Purchase College, the University of the Arts (Philadelphia) and at New York University. Jim appears frequently at schools and universities throughout the country as a guest artist/clinician and has been a clinician/soloist at numerous Eastern Trombone Workshops (now the American Trombone Workshop) and International Trombone Festivals. Although Jim currently performs on a BAC Custom trombone, he was instrumental in the development of small-bore instruments for both the Edwards and S.E. Shires Instrument Companies. A multi-decade long, close association with David Monette resulted in David’s development of the Monette TS6 and TS11 tenor trombone mouthpieces. Jim is also a consultant for the Facet Mute Company. Not formally a fan of mutes, Jim now enjoys stuffing anything made by the Facet Mute Company into his bell. He endorses all of these products and uses BAC horns, Monette mouthpieces and Facet mutes exclusively.